Both of these CDs smell a little different. This Raekwon CD was shrinkwrapped until today when I spun it for the first time. That new CD smell is something I’ll always treasure. It’s probably some sort of glue smell that’s minusculely toxically psychedelic, but for me, it’s a comfortable smell because I’ll always open up a new CD like this and give it the minute or so to really soak in the contents. I’m never stressed out or juggling multiple tasks when I’m opening up a new CD. Does the smell evoke a panging sensation toward those innocent moments? Or do the moments happen naturally when I’m in proximity to the smell? The Korn CD smells like pine cleaner. It has these mild, semi-concentric scuffs marks like someone went to it with a cheap buffer, but it plays well enough. One track had some skipping problems until I cleaned the surface with some strong cleaner. For a dollar, it does its job and has some nice character, but if I can find this same CD in higher quality for a dollar or two, I’ll probably swap it out, because I imagine I’ll listen to it more often than I have, once I get settled and sell off everything I won’t spin repeatedly. It’s fine to own some things you’ll listen to every dozen years or so, but not hundreds of those. What if I only want to hear it once every dozen years? Then when I remember, I’ll honestly just find it online. I’ve already spent thousands of dollars, collectively on music, so what sort of moral or ethical qualm should I have about not purchasing a CD from a music store? Besides, if the CD isn’t readily available on any streaming platform with advertising, I live nearby a robust library system that probably has it, and even that doesn’t get to the heart of the issue: the band gets close to nothing out of CD sales, unless it’s at the show, at the merch table, and the venue didn’t rip them off. So there’s no real point to vanity upgrades. The wear almost reflects the band’s image. In a sense, they carried on Nirvana’s legacy of raw emotive rock, put pushed into more of the metal direction. It would almost seem weird stylistically to have an overly-glossy copy of this CD by them. Do I want to carry the burden of this CD, especially if it’s worth some money? What if I find an upgrade in the next few months? Do I even want to open the shrinkwrap, in case I hate it? I’ve been avoiding asking really difficult questions this time around. When this essay publishes, I’ll have passed my initial deadline for moving out, but I have an extension, so I’ll still have another few weeks to completely be moved out. I don’t intend to rely on that, but it’s a nice cushion, anyways, which also means that I’ll probably have a few weeks where I’ll have all my CDs packed up and in storage. I’ll borrow some CDs from the library, or listen to albums online, so there won’t be a want for music in my ears, and I’m sure that especially after I’m packed, I’ll be back out in thrift stores and music shops, except, much more responsible in purchasing. Cost? – This always got me. Why not buy it if it’s cheap? Deal? – Well, it’s not a deal if it’s taking up space needlessly. Ease-of-access? – Can I easily find this CD online? Aesthetics? – Do I like the packaging and general look of it? Likeability? – How often will I listen to this CD? Once a decade? Let’s run through these two CDs as examples, if I were to buy them again. – Cost? I got this for a dollar, so it passes this. – Deal? A dollar would be a good deal for me. – Zeal? Good addition to the collection. – Ease-of-access? Easily available online. – Aesthetics? Mentioned above; works for me. – Likeability? This is the big one. While I enjoyed seeing Korn live, I haven’t heard many of their albums. They don’t come up that often in my mind, maybe about once a year I’ll consider listening to their music, so owning their entire discography might not be worthwhile to me, unless I see them again and am more blown away by them. – Cost? Two dollars is still a good price for CDs for me. – Deal? Especially when it’s shrinkwrapped. – Aesthetics? Also mentioned above. – Likeability? This is a good Wu album. Compared to previous years, or even months, I’ve been much more accepting toward getting rid of CDs that I don’t like. 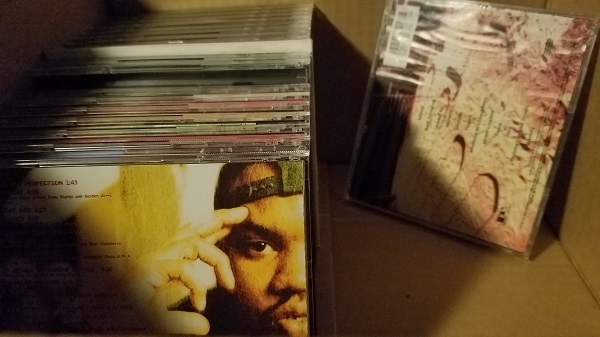 Whereas before it was almost agonizing to consider parting with some terrible CD, now I have two stacks of CDs to sell in maybe two music store runs, and a bag of CDs to donate that fall under the threshold for what I imagine would be worth selling. I’d rather not waste my time, money [to drive there], or energy trying to sell things, so it’s easier to go that route. So yeah, now, these are stronger factors for the music-listening process for me. Why buy/own something that doesn’t bring you joy? 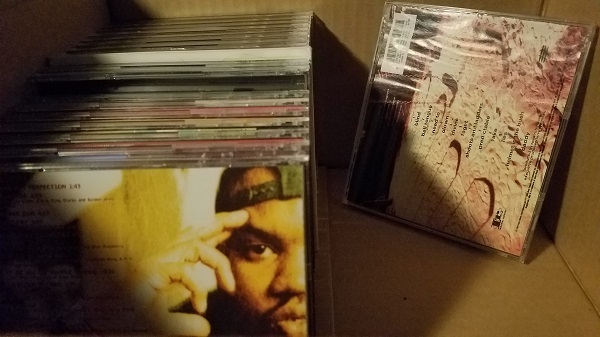 Inspirations: Just a rambling rant about my music, comparing two CDs I own, and the long-term value of cheap CDs. Photos: Different focus for the two featured CDs. Today was the first day I’ve heard both.